[Monday, February 1, 2010] In announcing its $19.0 billion FY 2011 NASA budget today, the Obama Administration has made it very clear that it intends to attempt a paradigm shift in the way that America explores and utilizes space. [Monday, February 1, 2010] The Next Step in Space Coalition and the Commercial Spaceflight Federation today will hold a joint teleconference for members of the media. [Monday, February 1, 2010] The National Aeronautics and Space Administration (NASA) plans to invest billions in the coming years in science and exploration space fl ight initiatives. [Monday, February 1, 2010] The Commercial Spaceflight Federation welcomes the decision today by President Barack Obama to place U.S. human spaceflight on a new trajectory with major investments in technology, science, exploration, and commercial spaceflight. [Tuesday, February 2, 2010] NASA leaders from Langley Research Center will join aerospace industry representatives statewide to bring this message to Virginia General Assembly members on AeroSpace Days 2010, Wednesday and Thursday, Feb. 3-4, in Richmond. [Wednesday, February 3, 2010] At a National Press Club event to "introduce new commercial space pioneers, John Holdren and Charles Bolden praised the seven winning companies of NASA's Commercial Crew Development and Commercial Orbital Transportation Services competitions. 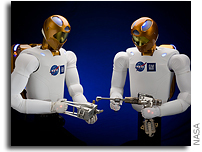 [Thursday, February 4, 2010] NASA and General Motors are working together to accelerate development of the next generation of robots and related technologies for use in the automotive and aerospace industries. [Thursday, February 4, 2010] James Cameron, the writer and director of "Avatar" and "Titanic" has published an op-ed in The Washington Post endorsing commercial human spaceflight and President Obama's new plan for NASA. [Thursday, February 4, 2010] SpaceX recently conducted a three-day long demonstration of cargo loading and unloading procedures for its Dragon spacecraft, which NASA has contracted to provide delivery services to the International Space Station (ISS) starting in 2010. [Wednesday, February 10, 2010] A 9-cubic millimeter solar-powered sensor system developed at the University of Michigan is the smallest that can harvest energy from its surroundings to operate nearly perpetually. [Wednesday, February 10, 2010] NASA presented its highest honor for quality and performance, the George M. Low Award, to two companies that share a commitment to teamwork, safety, customer service, technical and managerial excellence. [Thursday, February 11, 2010] Space Exploration Technologies (SpaceX) announces that all flight hardware for the debut launch of the Falcon 9 vehicle has arrived at the SpaceX launch site, Space Launch Complex 40 (SLC-40), in Cape Canaveral, Florida. [Thursday, February 11, 2010] In 20 years, we've had 200 licensed commercial launches. No fatalities, no extensive property damage, no injuries to the uninvolved public. [Friday, February 12, 2010] We are writing to express strong concern about NASA Headquarters actions and comments regarding the Constellation programs, the programs which together form the human spaceflight programs authorized by Congress in 2005 and in 2008. [Saturday, February 13, 2010] We plan to transform our relationship with the private sector as part of our Nation's new strategy with the ultimate goal of expanding human presence across the Solar System. [Saturday, February 13, 2010] Gingrich and Walker state, "Bipartisan cooperation has been difficult to achieve in Congress, but here is a chance. By looking forward, NASA has given us a way to move forward. It deserves broad support for daring to challenge the status quo." [Monday, February 15, 2010] The first batch of concrete was poured Thursday, February 11, marking the start of the final concrete finish phase of the runway construction at Spaceport America, the world's first purposebuilt commercial spaceport. [Thursday, February 18, 2010] NASA scientists, multi-disciplinary researchers, government officials and future space flight service providers are discussing new ways to access and utilize space science at the Next-Generation Suborbital Researchers Conference. [Thursday, February 18, 2010] At the Next-Generation Suborbital Researchers Conference today, Commercial Spaceflight Federation chairman Mark Sirangelo announced the creation of a new affiliates program for universities and other research and educational institutions. [Thursday, February 18, 2010] The Commercial Spaceflight Federation enthusiastically welcomes NASA's announcement today that NASA will fund dozens of science and education payloads to fly on commercial suborbital vehicles. »» NASA and the future of space exploration: what do YOU think? [Sunday, February 21, 2010] Veteran space journalist and NASA Advisory Council member Miles O'Brien will testify on Capitol Hill. What do you think? We appreciate your participation in this short survey. [Sunday, February 21, 2010] The Next-Generation Suborbital Researchers Conference (NSRC) has brought the research and education communities together with suborbital vehicle providers and government funding agencies for the first time. [Sunday, February 21, 2010] Following its mate to the transporter erector, Falcon 9 was rolled from the integration hangar to the launch pad where final checks of the pad hydraulic and pneumatic systems were completed. [Monday, February 22, 2010] NASA's Tracking and Data Relay Satellite (TDRS) K-L program completed its Critical Design Review (CDR) and Production Readiness Review (PRR) in El Segundo, Calif. on Feb. 19. [Monday, February 22, 2010] The research and education community voted with its feet last week with over 250 people turning out at the first-ever Next-Generation Suborbital Researchers Conference in Boulder, Colorado. [Monday, February 22, 2010] Boeing announced that the commercial launch of the Geostationary Operational Environmental Satellite-P, (GOES-P) is scheduled for March 2 aboard a Delta IV rocket. [Tuesday, February 23, 2010] Hailing President Obama's new plan for NASA, Governor Bill Richardson published an op-ed today praising the President's plan as "creating thousands of new high-tech jobs and helping America retain its leadership role in science and technology." [Thursday, February 25, 2010] NASA conducted a test to validate an approach that would be used to test the parachutes for the Orion spacecraft. Contrary to earlier stories and rumors, a mock up of an Orion spacecraft did not crash into the desert. Rather a large test sledge did. [Thursday, February 25, 2010] Today, the House Committee on Science and Technology held a hearing to discuss the Administration's FY 2011 budget request for NASA with Administrator Charles F. Bolden, Jr.
[Thursday, February 25, 2010] K.R. Sridhar used to spend his time as a researcher at NASA Ames Research Center, Moffett Field, Calif., looking at the sky and dreaming of ways to sustain life on Mars. [Friday, February 26, 2010] Burt Rutan has released a statement saying the Wall Street Journal "chose to cherry-pick and misquote my comments to Cong. Wolf." [Saturday, February 27, 2010] The Space Studies Board (SSB) was requested by NASA to conduct a review of the suborbital mission capabilities of NASA in the NASA Authorization Act of 2008 (Section 505).